Morning Star Lutheran School participates in the Wisconsin Parental Choice Program (WPCP). We are excited to offer the opportunity for families who qualify to receive a voucher from the State of Wisconsin to pay for their children’s tuition. The online registration for the WPCP opens on February 1st and closes on April 20th. You will need your 2018 tax documents to register. Students must be entering Pre-K 4, Kindergarten, or 1st Grade in 2019-2020. Students coming to Morning Star from the public school or another choice school may apply to enroll at any grade level. Students must reside in the state of Wisconsin (excluding the cities of Milwaukee and Racine) to qualify. There will be a 4% school district cap, but that cap has not been met in the current school year. Residents of the State of Wisconsin (excluding citizens who live in the cities of Milwaukee or Racine). How do I apply for a voucher? You need your 2018 tax documents to register. Please note that the window to register closes on April 20th. You can apply online through the WI DPI website (http://dpi.wi.gov/sms/choice-programs). Click HERE for step by step application instructions. It is recommended that you register using the DPI method. A simple mistake using the DOR method will keep you from qualifying for a voucher. Any mistakes using the DPI method can be corrected before the April deadline. Once you submit your application, you must bring tax information (Federal 1040 Form 2018) and proof of residency (WE Energies bill, wage statement, W2) to Morning Star to complete your application. Please note that this information will be kept confidential. 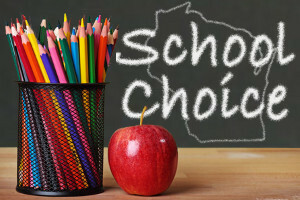 Parents or guardians enrolling students for the Choice program should direct any questions to Morning Star Lutheran School at (262) 677-9196 or school@morningstarwels.org.